Opponents of New Jersey’s attempts to introduce legalized sports betting in the state are renewing their legal fight against New Jersey’s efforts to seek a “clarification” from federal judge Michael J. Shipp regarding the 2013 ruling which upheld the United States’ federal PASPA (Professional and Amateur Sports Protection Act), a law that limits full-fledged sports betting to Nevada. The New Jersey sports betting battle has been renewed of late, with the attorneys representing the country’s major sports associations filing a memorandum on September 29 in an effort to block the latest efforts by the state to find a way to implement legal sports betting at the state’s licensed gambling outlets, as was authorized in 2011 via statewide voter referendum. Roughly three weeks ago, New Jersey Governor Chris Christie reversed himself and threw his support behind an effort to help the state overcome Shipp’s federal-level ruling regarding PASPA, which was left standing after the US Supreme Court refused to hear a final appeal in the case earlier this year. That left New Jersey officials struggling to find a way to implement legalized sports betting, a populist issue for the state’s residents. The temporary solution was for Christie and for New Jersey’s acting attorney general, John J. Hoffman, to issue directives stating that they would not enforce New Jersey’s old statutes related to a ban on sportsbetting. That ban was technically left in place when the injunction imposed by Shipp effectively nullified the 2011 voter referendum and subsequent law passed by the state. The latest flurry of activity in the state-v.-feds battle also included New Jersey asking Judge Shipp, three weeks ago, to clarify his ruling, since the language of the opinion upholding PASPA seemed to indicate that while New Jersey could not actively offer or regulate sportsbetting, it also need not necessarily ban it, and that PASPA itself only applied to state regulatory oversight. After receiving the state’s request for clarification regarding the injunction, Judge Shipp ordered that the plaintiffs in the case file their initial memorandum in response by September 29th, with formal reply briefs due by October 10th. The five sports associations — the NCAA, NFL, NHL, NBA and MLB — are represented collectively, while the US Department of Justice has joined the case on the side of the sports leagues and the federal PASPA law and has also responded by memo in response to the clarification effort. FlushDraw has obtained both complete sets of responses, and will examine the DOJ’s separate memo in another post. As for the leagues, their lengthy response included an 18-page primary brief, plus eight appendices serving up news reports and state filings regarding Christie’s reversal on the matter, plus the language of the recent bill (NJ Senate Bill 2290) which would have repealed the state’s sportsbetting ban and which Christie inexplicably vetoed. In recent days, a third version of a bill which attempts to nullify the state’s still-existing sportsbetting ban while finding a way to work around the federal PASPA ban has moved toward a state Senate vote. That latest bill appears to be something of a contingency plan in case Judge Shipp shuts the door entirely on the state’s attempt to receive a clarification regarding Shipp’s standing injunction. Slamming the door shut on New Jersey’s latest motion without issuing a clarification is exactly what the leagues and the DOJ want Shipp to do. Each of the three claims then receives several pages of supporting assertions and legal references. From a layman’s perspective, the league’s first claim might not stand, because the nature of the PASPA ban itself has created some ambiguities. 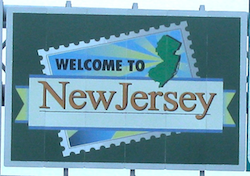 However, the second and third claims represent serious sticking points for New Jersey’s planned PASPA workaround, in that leaving the Sports Wagering Law — the formal result of the 2011 voter referendum — in place by extracting only a few key phrases and declaring them legal just may not pass federal muster. Likewise, the existing federal PASPA ban seems clear on this point: New Jersey officials can allow sports betting to occur within the state, but they cannot regulate it or declare it a state-authorized activity. To date, none of the workarounds created by NJ State Sen. Ray Lesniak or Gov. Christie have addressed that issue in full, or described a path through how state officials can monitor legalized sports betting and extract tax revenue for the state’s coffers without running afoul of the PASPA ban. We’ll return to the battle over New Jersey sports betting with a look inside the DOJ’s own brief on the matter, which covers similar territory in its efforts to block New Jersey from implementing any sort of framework under which legalized sportsbetting can occur in the state.